XCMG Africa has launched the largest XCMG wheel loader currently available in Southern Africa. 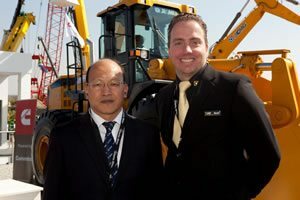 “The new LW900K wheel loader, which was introduced to the local market at Bauma Africa 2013, is an exciting development for XCMG, to support the development of diverse industries, including the construction, mining and infrastructure sectors,” says Martin von Gericke, CEO, XCMG Africa, part of the global XCMG Group. “Continuous research and development forms part of the Chinese principal’s strategy to gain market share throughout the African continent. The robust LW900K wheel loader, with a 9 tonne loading capacity, has been designed for improved productivity, reliability and operator comfort. This environmentally-friendly machine also boasts low emissions in compliance with more stringent environmental regulations, including European and American emission regulations and standards. The new electronically controlled Cummins QSM 11 engine has a power rating of 250 kW at 2100 rpm and is supported by Cummins South Africa. A cyclone type pre-filter, combined with a double filtering system, prevents the engine from damage in dusty environments. The ZF 4WG 310 transmission, backed by ZF South Africa, has ZF electro-hydraulic shifting and is designed for improved working efficiency. The functions of neutral gear start protection, shifting locking and the KD gear, are easy to operate. The single handle pilot control system reduces operating force and enhances operator comfort. An added safety feature on the transmission is a neutral starting facility and a gear shift lock out. The transmission is also equipped with a KD function. The LW900K features a factory fitted steering accumulator to facilitate steering if an engine or hydraulic failure should occur. This improves operator safety and protection of the unit. Articulation limit is hydraulically controlled. The efficient combination of the low emission Tier III Cummins QSM11 engine and ZF 4WG310 transmission – with the addition of ZF wet axles – results in a highly durable machine, perfectly designed for efficient operation in arduous mining and construction environments. These wet multi-disc brakes are totally enclosed which prevents the ingress of dirt, thus reducing wear and minimising maintenance requirements. The hydraulic brake system also features a self-adjustable hand brake system. This machine has also been designed for low oil consumption. This is achieved with a high torque engine and high capacity torque converter which ensure optimum efficiency during low speed travelling. Other key features include the steering accumulator, automatic lubrication system, oil warmer and differential lock. These wheel loaders also have a newly designed ROPS and FOPS cabin, HID/LED lighting and air-conditioning for enhanced operator comfort. Bucket capacities of the LW900K series vary between 4,0 m³ and 6,9 m³, with a rated bucket capacity of 4,5 m³. 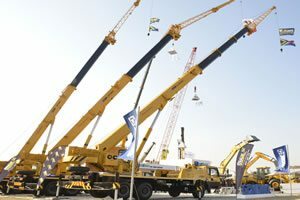 These machines have a dumping height of 3 400 mm and a dumping reach of 1 470 mm. The wide track design and long wheelbase ensure stability and enhanced safety, even in rough working conditions. 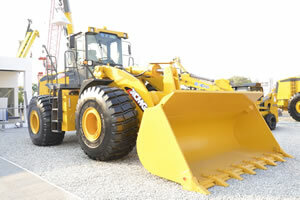 The maximum articulation angle of the loader is 40°, with a minimum turning radius of 6 200 mm. This new series, with a specially designed engine layout and large access bonnet doors on both sides, ensures easy servicing and quick daily maintenance. For enhanced safety during maintenance, the engine and transmission filters can be changed through the engine compartment.